can be really HARD! A while ago I saw a tutorial for some car organization items...one of those items was a trash 'can'...which is more a bag. I don't remember where I saw this, but the idea stuck. I didn't really read the tutorial...sometimes I'll just skim through something and then figure it out for myself. All I remembered was a basic shape and the use of a plastic container. I came up with a pattern using a 4" embroidery hoop and a plastic bag... I LOVE how they turned out. The fabric makes a nice holder and looks nice, while the plastic bag gets the trash and is replaceable. Just loosen the inside of the hoop, take out the bag, and replace with a new one...easy clean! The first one I made had a slight issue where the hoop meets...but by the time I made the third one (the brown one) I had that area all figured out. ﻿The third one is also different because it has a 6" hoop instead...I think I like the smaller one, but I broke the third 4" hoop I had and I'm not going to the store till Monday - I'll have to get a few more hoops :)! The bags I used are Twist Tie Bags - Gallon size. The Grayish-tan Can is for my SIL's birthday, the green one is for Chad's Birthday, and the Brown one is mine. Tonight we are celebrating the birthdays...Chad is seven years and one week older than his sister...so we sometimes combine the party! Today I made a Strawberry-Rhubarb pie for SIL...Chad always gets a DQ Ice Cream Cake. I was excited because the pie crust actually turned out...well enough to even do a lattice top! I think this is probably only my 2nd or 3rd time doing a lattice top. It was a way to see how the personality of your husband gives the wife different kinds of freedoms and abilities...I'm happily married to a Mr. Steady and as such am able to be craftily creative with his blessing. Happy Birthday Chad...you are my rock! that pie makes my mouth water...and those sweet little trash bags? adorable...me thinks you have an etsy store in your future...thanks so much for linking up to fridays unfolded and so nice to 'meet' you! Just the other day I was thinking I need a car trash bag, I love the embroidery hoop idea! And Strawberry Rhubarb pie is my true love... That looks delicious! Thanks for showing off! Great bags - so handy. A friend makes them from old nylon track pants that she picks up at the thrift store - no need to line, and completely washable! What a great idea! 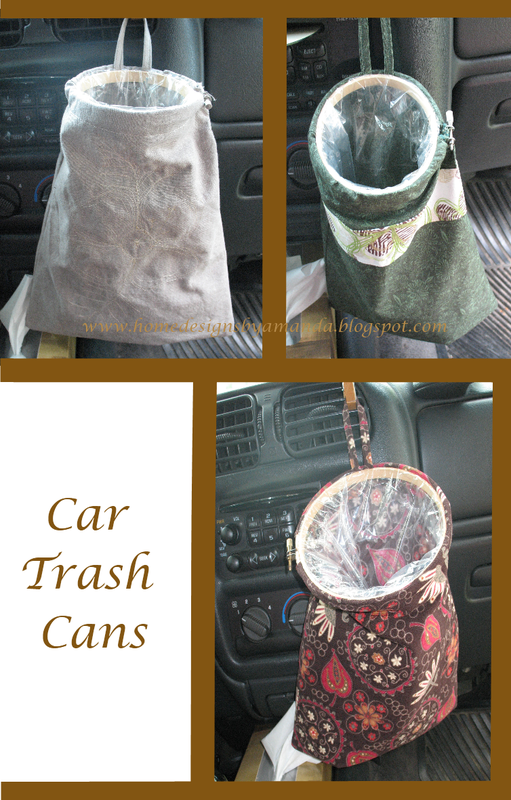 I'm going to make some of these so my kids have their own personal trash can at their seats in the van. Thanks for sharing!